If you live in Chicago it probably doesn’t take too many winters colder than the surface of Mars to consider taking a proper vacation to the sunnier parts of the United States. The most logical choice? Los Angeles, where you’ll enjoy the same metropolitan pace of play, a vast slate of food and drink options to indulge in, and the opportunity to share your bragging rights about baseball and hockey (maybe even still football) with a Vince Vaughn-ish panache. While Los Angeles has more that a few degrees of separation from Chicago, there are a lot of parallels to the creature comforts you’re used to in The Windy City. Take it from a Chicagoan-turned-Angelino who eschewed thundersnow for 70-degree days; when you’re in need of great beer, beautiful architecture, and anti-adulthood fun, LA has you covered. Without igniting a powder keg of pizza arguments, let’s just say that the reports of LA’s pizza futility have been greatly exaggerated. With spots like Desano, Settebello, and Sotto, the top pizzerias out here are on par with any city outside of New York -- and thanks to Masa, there’s even a solid deep dish option in town. You’re instinct may be to scoff, possibly even “harumph,” but trust that their pies filled with whole pear tomatoes, sweet Italian sausage, and a spot-on cheese pull could easily pass for a tourist draw off Michigan Ave.
Coming from Chicago, your standards for a good hot dog are understandably pretty high. While LA might not have neon green relish or poppy seed buns, it still has a reverence for good wurst. Leading the charge is Wurstküche, a Bohemian beer hall with locations in Venice and Downtown, where exotic grilled meats are on the menu in combinations like rattlesnake and rabbit; duck and bacon; or veal, rabbit, and pork. 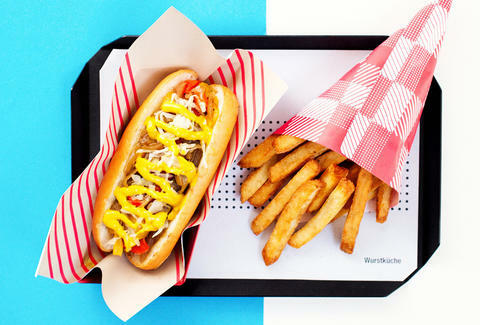 While street dogs wrapped in bacon may seem tempting, save your late night appetite for Wurstküche. Since your idea of “a scene” is drinking on the cheap in a bar that you’d never refer to as “a scene,” the Smog Cutter is going to feel like home. There’s a cash only policy, delightfully sassy bartenders, and a karaoke machine THAT RUNS ON CDs! Peel off that rendition of “With a Little Help from My Friends,” and then high-five the barfly on the corner stool. Game recognizes game. In terms of riding the wave of upstart craft breweries, LA is quickly catching up to Chicago. There’s no taproom more credible than that of MacLeod Ale Brewing Co. (think: a more dive-ish version of Half Acre’s Tap Room). A welcome deviation from the abundance of West Coast IPAs, the brewery is a love letter to British, cask-only ales from the owner, who is Scottish and has a wife who plays in a bagpipe band. In terms of skyscraper-filled skylines, you’re trading off Chicago’s iconicness for LA’s weather where you can reliably enjoy the view more than two months out of the year. 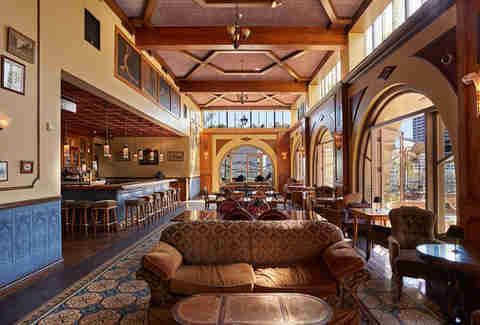 With similar aesthetics to Drumbar and The J. Parker, Perch provides one of the most scenic views in the entire city. The French rooftop bistro is primed for sitting around a plate of cheese and charcuterie and indulging in that bottle of Perrier-Jouet Grand Brut you never thought you’d have for breakfast. Many renown improvisers and sketch performers have cut their teeth in Chicago’s comedy scene and then moved on to the entertainment mecca of Hollywood. The LA branch of iO, the popular hub founded by improv godfather Del Close, features some of Chicago’s (well, formerly Chicago’s) top veteran improvisers on teams like The Reckoning, Cook County Social Club, and Dummy, most of which you can catch regularly on Thursday nights. Tip: catch The Office ’s Kate Flannery in her comedy lounge show, The Lampshades, which is now in its fourth year. If you somehow blended the hipster-chic vibe of The Hideout and the energy of a Wrigley sports bar you’d have The Escondite. From jazz to rock to honky tonk, it’s only toe-tapping tones here. Add in a lineup of outstanding burgers like the Nacho Man Randy Sanchez -- a burger patty blended with Slim Jims, drenched in nacho cheese, and topped with Doritos -- and you’ve got a spot you can’t find anywhere else. Shows can be as long as four hours, making this a perfect place to camp out with friends. After spending a few hours passing the picturesque boardwalks of Santa Monica, you’ll hesitate to classify the sandy shores of Lake Michigan as “beaches” ever again. Pedal around to make the obligatory pilgrimage to Route 66’s endpoint on the pier, gawk at the innumerable body types to be seen, and dig into a poke bowl (“Hawaiian Style” = no rice, a lot more tuna) as you bask in the sunshine. There no award for “LA Bar that Would be Most Likely to Hang an Old Style Sign,” but there should be in Crawford’s case. It’s a haven of hot chicken and happy hours meant for shooting pool and listening to respectable tunes. Heck, you might even be able to get a serviceable Euchre game going. Since there’s no complaining about the weather in Southern California, that energy goes toward complaining about traffic, especially since locals spend 90+ hours per year stuck in it. 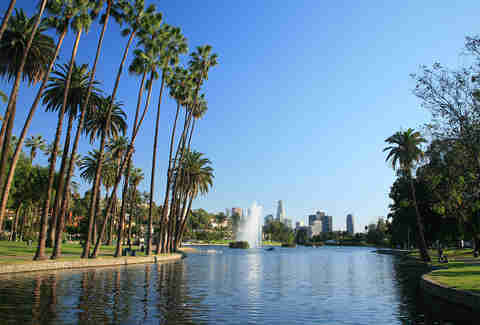 But one of the benefits of having such a sprawling city is that there are numerous alcoves of green space like Griffith Park, Silver Lake Reservoir, or Runyon Canyon, sprinkled throughout the concrete jungle. Grand Park is a thin slice of peace and quiet downtown with the allure of fountains, public art, and the occasional outdoor concert in the summer. And hey, it even sounds like Grant Park. It’s like LA’s city planners knew! There’s a boutique for everything in this trendsetting east side neighborhood. There’s Origami Vinyl for record-swapping, Ampal Creative for beanies and bucket hats, Myrtle for supped-up Anthropologie-style womenswear, and Shout & About for stationary that expresses the naughty things you’re thinking but Hallmark is too afraid to print. The walkable stretches on Vermont Avenue will certainly remind you of Wicker Park, except there’s a place that sells churro ice cream sandwiches. For when you want a safe space with guest DJ sets to drown out your bad decisions, Rush Street is your Viagra Triangle away from home. There are half-price wine bottles on Tuesdays and a 100% chance of meeting a Big 10 alum who does something with marketing. Yes, you will certainly see celebrities during your trip to Hollywood, even if it means they’re six feet under. 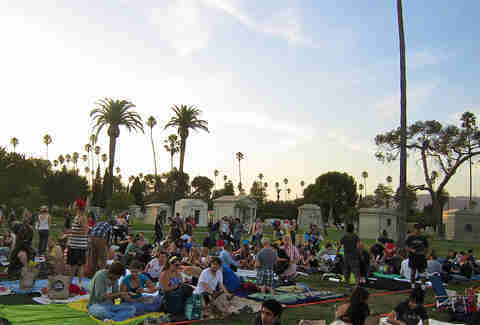 There’s an undeniable charm to Hollywood Cemetery, the resting place of Jayne Mansfield, Mel Blanc, and Johnny Ramone and an awesome venue for summer concerts and movies. Bring your blankets, picnic basket, and booze, and check your heebie-jeebies at the gate. Hanging out at a cemetery isn’t necessarily creepy; Chicago’s own Graceland Cemetery was designed for picnics and pleasant strolls. You’ve got to show LA how to reverently enjoy a burial ground the Chicago way! The first place in the US to ever serve Irish Coffee ought to be a preserved landmark. You will be slightly jealous that this bar isn’t back home in Chicago as it combine elements of every genuinely good St. Patrick’s destination Chicago has; even if you’re not beloved enough to earn a shamrock on the wall (you pretty much had to have played on the Rams 70 years ago or be Julia Roberts). Sean Cooley is a food and travel writer based in Los Angeles and he’s still amazed that RBI Baseball 3 gave Dennis Eckersley his own special throwing animation. Follow him on Instagram.